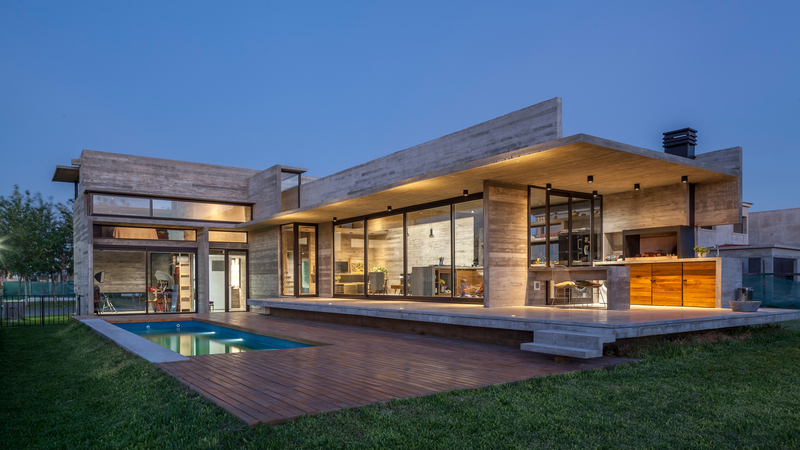 Argentinian firm Estudio Besonia Almeida has published their recently constructed Casa Berazategui residence on their website. Located in Buenos Aires, the dwelling is formed from concrete planes that intersect in perpendicular arrangements that allow for the creation of voids pertaining to both interior and exterior space. As a result, two facades at the front and rear of the building evoke two different Bauhaus-esque qualities. At the front, hints of Marcel Breuer (who trained at the Bauhaus) can be seen with concrete massing that provides privacy. Meanwhile, an L-shaped plan allows for a much more open style to look onto the garden in a Mies van der Rohe (who taught at the Bauhaus) style that makes use of horizontal planes and decking. Timber and glass are also interspersed throughout the building and serve mostly as detailing and furnishings. Glass panes also cut through the building in a similar fashion, often horizontally to form clerestory windows. Floor-to-ceiling windows and sliding glass doors are also used extensively to the rear of the building, opening it up and visually connecting interior spaces such as the kitchen and dining room to the garden. The intersectional planar and massing strategy derives mostly from the study of light. "This is a topic that interests us particularly, so there is, in all the projects, a special intention addressed both to control the incidence of sunlight on glass surfaces as to improve natural light as a project material which brings wealth to the living spaces," the firm said. "If we understand the openings as such, not as standardized elements with preset measures and positions, but rather as carved into the buildings which, of course permit ventilation and lighting environments, but also leave undefined the indoor-outdoor relationship, framing the landscape, filtering light, reflecting it on a wall, etc., these perforations will be the result of the special way in which we want to establish these relationships. The L-shaped plan also facilitates a variety of programs within the building too, accommodating for community and social-based areas. These are situated along the lengthier axis of the plan while bedrooms and offices are situated on the other. As a result the house is clearly divided into private and semi-private sections with the bedrooms being able to gain a view over the garden. According to the firm, the client required room for family growth. "It was clear they needed a generous gathering place with an integrated kitchen, a veranda with barbeque and a swimming pool that should be protagonist," they say on their website. Tower of Babel. 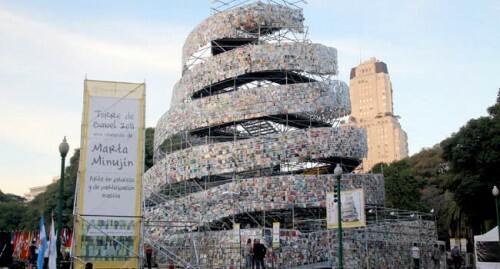 Argentinian artist Marta Minujin has created an 82-foot tall "Tower of Babel" in Buenos Aires after the city was named UNESCO's World Book Capital for 2011. Readers, libraries, and 50 embassies donated over 30,000 books in a variety of languages to fill the twisting structure. The Guardian has a slideshow and we posted a video of the tower after the jump. High Line Caution. 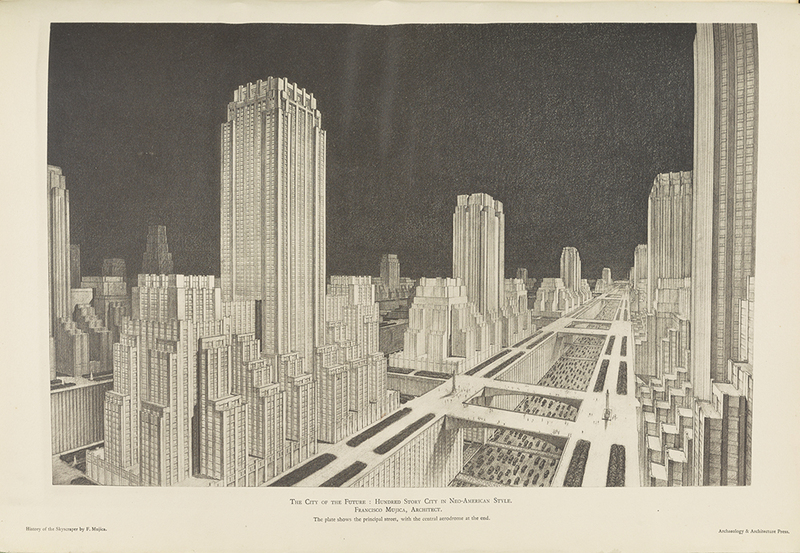 Witold Rybczynski penned an op-ed for the NY Times cautioning the many would-be High Line copy cats that the success of the New York wonder-park (and a Parisian predecessor) aren't because of the parks themselves, but because of their unique situations in dense, thriving cities. Tower Trouble. The Wall Street Journal writes that skyscraper construction has dropped off drastically from decades past to the tune of 14 million fewer square feet per decade than the period between 1950 and 1990. Can New York maintain its global competitiveness without ramping up construction? Twin Lions. Two stone lions, Leo Astor and Leo Lenox, have been standing sentinel at the New York Public Library's main entrance on Fifth Avenue since 1911. Ephemeral New York posted a little more history on the backstory of the big cats.